THE campus of the Department of Management Studies (DMS) is a vision of India’s future disguised as the past. Shoeless gardeners sprawl on dusty grass or haul ancient mowers. Yet the business school, a faculty of the elite Indian Institute of Technology in Delhi, is one of India’s best and its students among India’s—which means the world’s—brightest and most driven. Oxford and Cambridge accept one in five of their applicants. The DMS interviews 3,000 candidates for 65 places. All computer aces—the school specializes in data analytics—its students are typically in their mid-twenties and have spent a couple of years with a top Indian technology company. After their MBA, they go on to global IT or consulting firms, such as Accenture or KPMG. They are the sort of high-flying Indians who helped build Silicon Valley, are remaking India’s global image and whom David Cameron yearns to impress. Wooing the new India is “at the top of the priorities of the UK’s foreign policy,” the prime minister told his Indian counterpart, Narendra Modi, on November 16th. The DMS is therefore a good place from which to gauge his progress. A group of students gathered to enlighten your columnist after hearing a pitch from an American analytics firm. Their hunger was visible: they craned to hear Bagehot speak. But he was there to listen, and what he heard was a masala of ideas about Britain which, though mostly positive, had bad news for Mr Cameron. None of the students was interested in India’s colonial past, but many liked the shared inheritance it had left: “Our political system and institutions are from Britain,” said Rahul. Just as Britons often overestimate how well they understand India because of this, so the students had one or two odd notions. “Traditionally, Irish and Scots like India but the English and Welsh don’t,” said Abhishek confidently. Yet the advantage Britain enjoys from its far-flung culture was more obvious. It was the country most of the students most wanted to visit on holiday—to see Stonehenge, Old Trafford, the home of Manchester United, and Lord’s Cricket Ground. Some said they wanted to watch India play Australia there, which represented either the apogee of global sporting culture, or poor knowledge of India’s favourite game. Yet there was a cloud on their western horizon, in the form of Mr Cameron’s immigration policy. As Britain’s visa regime has tightened on his watch, the number of Indians studying in British universities has more than halved. Rahul was offered a place by the London School of Economics, but denied a visa to take it up—“because they didn’t think I would leave, even though I go to one of the best business schools in India,” he said crossly. Most said Britain was still accessible for study but, because foreign students must find employment within a month of graduating, hard to work in. “Study abroad is a long-term thing for us because we need to work to pay off the debt,” Utsav complained. “So people are less interested in going to the UK,” said Pavan. Half the students had a more negative view of Britain because of this. Only three realised Mr Cameron wanted to improve British-Indian ties, and one assumed that meant “trying to sell us jet fighters”. Senior Tories acknowledge the problem. When Mr Cameron, in opposition, pledged to bring annual net migration below 100,000, Britain’s net immigration from EU countries, which it cannot control, was around 60,000. Because of the euro crisis, it has soared, to around 130,000 immigrants this year, forcing the Tories to squeeze non-EU immigration in a failing effort to keep their pledge. This is self-defeating. On his first visit as prime minister, Mr Cameron dared to imagine a new “special relationship” with India; on two later trips he was barracked over visas. Viewed generously, his recent pledge to curtail EU freedom of movement is an effort to fix this. “If we have fewer low-skilled Europeans we’ll have more high-skilled Indians,” says a Tory minister. But that is not straightforward. With other European governments primed to slam Mr Cameron’s proposals, which he promises to unveil shortly, it risks leading Britain out of the EU. That is not something Mr Cameron or most of his ministers want; Philip Hammond, the Eurosceptic foreign secretary, may be a strangely placed exception. Another problem is that, even if Mr Cameron believes he is attacking Britain’s policy of open borders in order to improve it, most people only see the attack. “Britain is becoming more closed as an economy,” said Konark. “I also gather there’s a xenophobic shift there. A friend faced a racial attack, which you expect in France, but not Britain, which has such a long history with India.” Would this stop him coming back? “That’s a cost-benefit analysis I need to do,” he said, suggesting an understanding of risk of which Mr Cameron is bereft. The DMS folk underlined how damaging that could be. Asked whether India was well understood in the West, they shook their heads. “People know about Indian IT but not that other industries are coming up,” said one of their professors. 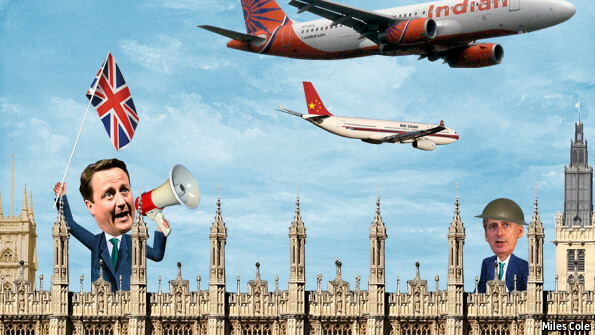 Graphic design, advertising, film production, even aerospace: in such industries, in which Britain excels, India is rising, and as the irreversible logic of globalisation unfolds, so global competition will increase. Mr Cameron should worry a lot more about competitiveness, and not trash the global brand Britons are lucky to have.